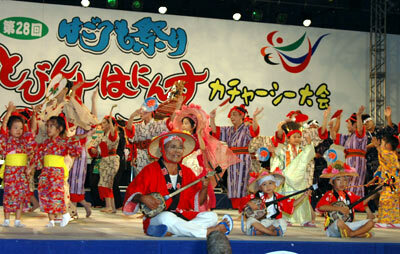 It is festival time in Ginowan this weekend, and more than 100,000 spectators are expected to participate. The 29th annual Hagoromo Festival, a harmony and friendship event sponsored by the Ginowan City, explodes into fun at Kaihin Park, adjacent to the Okinawa Convention Center. This will mark the sixth year the crowds are expected to burgeon beyond 100,000, with the two-day event predicted to reach a new record. Opening Ceremonies at center stage are Saturday at 4pm, launching an afternoon and evening of music and dancing that includes Hagoromo Taiko drums, Eisa, dance performances and concerts. A live concert at 4:20 takes place at the outdoor theater, and admission is free. The traditional parade from the Convention Center¹s Kankuimon Gate takes place at 5:20pm. Take a camera, because the parade features eisa dancing and traditional historical costumes. Eisa dancing will fill the evening, starting at 6:50pm. Sunday promises much of the same, and includes a Hagoromo bull fighting tournament at Akamichi bull fighting ring in Ginowan. That event begins at 1:30pm. Another afternoon event at the main festival site is arm wrestling, starting at 1:30pm. Kachashi dancing contest fun kicks off at 4:40pm, and leads into the evening¹s music. A 20-minute fireworks extravaganza fills the night skies beginning at 9:10pm. A main theme of the festival is ³Kachashi,² a joyful Okinawan folk dance, very much alive to this day that locals dance on happy occasions. Especially in the countryside, one can see folks spontaneously join in kachashi with the accompaniment of sanshin and small drums. ³Hagoromo² or ³Haninsu² in Okinawan dialect means a ³celestial robe.² There is a legend involving ³hagoromo² that is also known in a bit different variations elsewhere in Japan and around the world. but in vain. This seemed to disturb her, so the man came forward and talked to her gently, and invited her to his house, where he dressed the maiden with his own clothes. Later they got married and were blessed with two children, a boy and a girl. One day, the maiden heard her elder child, a girl; sing a lullaby to her brother. The song was about the robe kept in the storage. Although she had a happy life she could not resist getting it back. She found her robe in the storage area, took it out and put it on, and immediately had to go back to heaven leaving her husband and two children. The story usually ends here sadly, but the legend of ³Hagoromo² told in Ginowan City continues as follows; the son became King Saion, a powerful lord in the 14th century who contributed greatly for building the Kingdom of the Ryukyus. 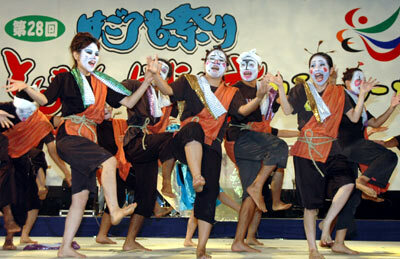 The name ³Hagoromo Kachashi² was taken from this pleasant story and combined with the energetic dance of Kachashi. Those who missed Naha¹s big Eisa festival last weekend will find this a good substitute to see a festival with participants clad in Ryukyu Kingdom era dresses. Plenty of games, food and cold beverages are available at the numerous booths on the festival grounds. As with all festivals, entry is free. Spending is what you want it to be, and is driven by thirst and hunger levels, and the ability to resist buying souvenirs at the countless stands which ring the festival site. From northern military bases, travel south on Highway 58. Immediately after passing Camp Kitamae Gate, look for Convention Center signs and turn right. Convention Center and festival site are about three kilometers south. Coming from Camp Kinser and Naha, travel north on Highway 58. At signs for Convention Center, turn left. Site is about 1.5 kilometers away.